Tonight me and a few others attempted a world first (as far as I'm aware). We used Google Hangouts to build a dungeon. Seven of us contributed at various points throughout the 90 minutes. The product of which can be seen in this map and the accompanying document. Big thanks to Jez Gordon for suggesting we use his DungeonFu template. It proved incredibly useful. The scene of a theological debate between pixies, frogs and clams. A HUGE table of random smells, sounds and other weird stuff. Acid traps and humming mushrooms, just to remind you that this is probably for D&D. People seemed very happy to get imaginative! We didn't end up with orcs guarding chests. There was less messing with other people's ideas than I expected. It's good because people got to flesh out rooms by themselves but I'd have loved to see a bit more collaboration. We made a deadly dungeon. Thanks to Nadav Ben Dov, Kyrinn S. Eiss, Barry Blatt, Joshua Macy, James Paese and David Reichgeld for contributing (let me know if I missed you off!). 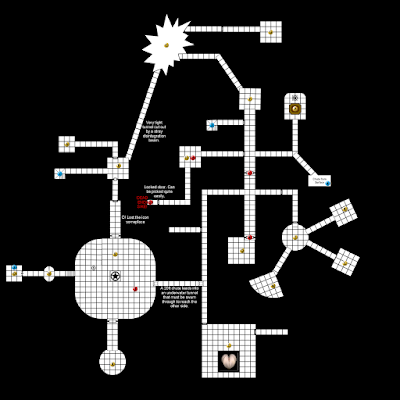 For the rest of you, let me know if you decide to do anything with this dungeon. It's so fresh I haven't even had a chance to look at the whole thing myself yet! 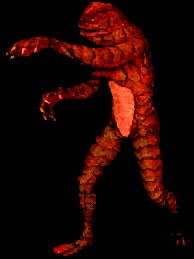 The Red Scaled Man STR 10, DEX 13, WIL 13, 12hp. 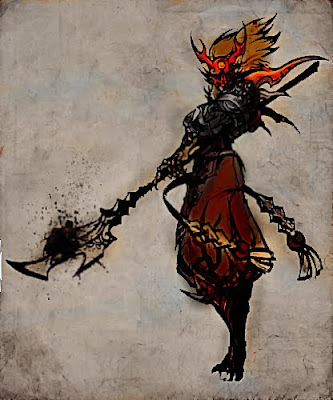 Roams with his warrior cultists, using his Horned One spell on his followers in times of danger. If an opponent is weakened he will try to use Banish to appease the terror lizards from beyond. Ceremonial Dagger causes 1d6 damage and is an Arcanum containing Banish and Horned One. Banish (Power 8): The target must pass a DEX Save to avoid your touch, or they are banished to an extra-dimensional jungle filled with terror lizards. This leaves a glowing portal that anyone can follow through for the next few minutes. 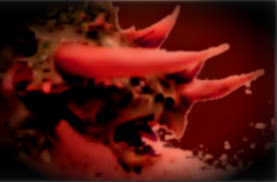 Horned One (Power 4): One willing ally writhes and twists, taking the form of a Great Horned Lizard. They fight loyally until at 0hp, twisting back to their original form, now dead. STR 18, DEX 8, WIL 4, 20hp, Armour 1. Attacks with a gore for 2d6 damage. STR 8, DEX 9, WIL 9, 2hp. Will not fight, but are willing targets for the scaled man's Horned One spell. STR 13, DEX 12, WIL 10, 8hp, Armour 1. Dressed in exotic armour, their helms can never be removed. Will fight to the death as long as the red scaled man is alive. 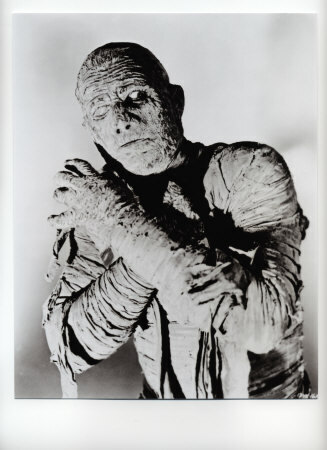 When did Mummies become the hard-hitting tanks of the undead? They're presented as slow but super-strong in both D&D and Warhammer. Seems to me they should be the frail but magically powerful leaders of vast ancient armies. A very specific flavour of lich, really, perhaps awakening after a set number of millennia. Possible future spoilers for anyone playing in my Into the Odd game. Mummy of Emperor Kthataktha the Giver STR 5, DEX 1, WIL 20, 15hp, Armour 1. Dressed in full ceremonial armour and wielding an ornate spear, the mummified remains of the once great emperor cannot move without help. Indeed, he is never seen off his jade throne, which is carried by twelve brass skeletons, who serve only as an elaborate means of transport. He speaks in a raspy groan, needing to be translated by one of the few living speakers of his empire's dead tongue. His thoughts are entirely set on regaining his stolen treasures and establishing a new empire. The emperor can use any Arcana, even those wielded by his enemies, within 30ft as if he were wielding them himself. He is bedecked with jewellery and a foot-high crown. Together these jewels function as an Arcana containing the spells listed below. Only one of the Emperor's bloodline can wield these items. Anyone else that tried is blasted with lightning for 2d6 damage. Eternal Hunger (Power 5): One target within 20ft must pass a WIL Save or lose 2d6 STR and you gain that many HP, even if it takes you above your maximum. These extra HP are lost when you have a full rest. Death Knell (Power 7): All living creatures within 40ft must pass a STR Save or take 3d6 damage. Even those that pass this spell are deafened until they next have a full rest. Eyes of the Stars (Power 8): You know the exact location of one object or being you have touched before.